GIS Day 2015! Happy 10th Birthday to the GIF! The GIF began in November 2015 on a wave of excitement around geospatial technology. In the months leading up to our first GIS Day in 2005, Google Maps launched, then went mobile; Google Earth launched in the summer; and NASA Blue Marble arrived. Hurricane Katrina changed the way we map disasters in real time. The opening up of the Landsat archive at no-cost by the USGS revolutionized how we can monitor the Earth's surface by allowing dense time-series analysis. These and other developments made viewing our world with detail, ease, and beauty commonplace, but these were nothing short of revolutionary - spurring new developments in science, governance and business. The decade since then has been one of intense innovation, and we have seen a rush in geospatial technologies that have enriched our lives immeasurably. As 2015 ends we can recognize a similar wave of excitement around geospatial technology as we experienced a decade ago, yet one that is more diverse and far reaching than in 2005. This GIS Day we sought to highlight the societal benefit derived from innovators across academia, non-profits, government, and industry. On November 18 we co-hosted GIS Day with BayGeo (formerly BAAMA) as we have in the past and had well over 180 attendees. Our GIS Day featured posters, lightening talks, presentations, and a panel session that included local innovators from Bay Area Industry, Government, and Non-Profits. 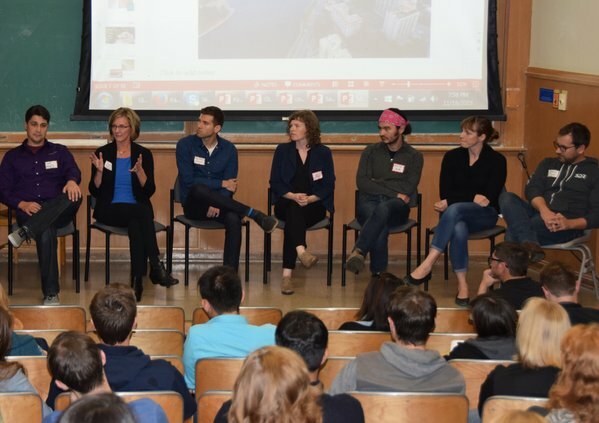 Our panel speakers included: Cindy Schmidt (NASA); Gregory Crutsinger (3D Robotics); Karin Tuxen-Bettman (Google); Ken-ichi Ueda (iNaturalist); Sara Dean (Stamen Designs); Jeffrey Miller (GeoWing); and Kyle Brazil (Urthecast). The discussion included what skills they look for in recruiting and where they see the geospatial world going in the next 5 years. It was a fun evening and personally, I learned a ton. Many levels of appreciation go out to those who spoke, those who came, and those who helped make the day happen.